From Google’s project discussed in the first post of this series, it may sound like you “just” need to tell people to take turns during a conversation and to listen to one another more. You can “just” instruct employees to be sensitive to how their colleagues feel and to notice when someone seems upset. But how often have you been part of authentic conversations at work, talking about your feelings while feeling you were in an emotionally stable environment ? According to the research at Google, what the Project Aristotle has taught people within Google is that no one wants to put on a ‘‘work face’’ when they get to the office. No one wants to leave part of their personality and inner life at home. But to be fully present at work, to feel ‘‘psychologically safe,’’ we must know that we can be free enough, sometimes, to share the things that scare us without fear of recriminations. We must be able to talk about what is messy or sad, to have hard conversations with colleagues who are driving us crazy. We can’t be focused just on efficiency. In addition, let’s not hide from the truth, this is hard to change our glasses and our patterns, and ultimately our behaviors. 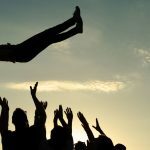 Since we have been “moulded” for so many years to act defensively at work, to protect ourselves and our teams, it may not always be easy to embrace a trust-based perspective, as discussed in our second post. So, what can we start to put in place both at an individual level and at a more collective and organizational level? At a personal level, mindfulness is certainly a great place to start. We have already looked at mindfulness on this blog. Based on the number of emails I have received, I take that this was very well received, and even embraced by some readers of this blog. This is really great to see indeed. Mindfulness helps us to see how sometimes we can be driven by fear and ego. It all starts with this profound awareness first. If we do not develop that new awareness, we will continuously be driven by fear, even without knowing it. Looking at some example provided in the table in the second post, are you able to distinguish similar fear-based attitudes and reactions? Yes, it is not comfortable to admit it for ourselves, but unless we make that conscious effort, nothing will change in you and around you. The good news is that you will allow others, as a mirror of the changes happening in you, to also move from a place of fear to a place of trust. What can we also do at an organizational level ? Well, we also have discussed it in great details in the “Reinventing Organizations” series and ebook. At its core, what Frederic Laloux suggests in his book, following examples from companies from across the globe (named “Teal organizations” ), is that it is possible to create more inspiring trust-based organizations … while delivering exceptional business results. Teal Organizations have found the key to operate effectively, even at a large scale, with a system based on peer relationships, without the need for either hierarchy or consensus. The good news: yes, we can change. There are ways. At the end of the day, it is really a matter of whether we want to change. And if so, whether we intent to become the change agent our very own organizations and teams need.